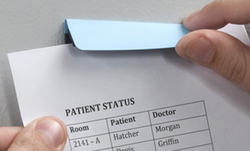 Care supervisors are turning to adhesive MagnaSnap note holders to post information. Placing rounding sheets in patient rooms encourages patient Ð staff interaction. Hourly rounding improves patient satisfaction scores and reduces call light use. Magnatag® Visible Systems, a division of W.A. Krapf, Inc., designs and manufactures over 2,300 steel whiteboard kits, calendar boards, maps and other information display systems. See their website at http://www.magnatag.com or call 800-624-4154. Hospitals tell us MagnaSnaps give them a clear, convenient effective location in any room for posting I/O and other patient care data sheets and updates. They stick tight to any clean, dry, flat surface and come in 11 colors with a damp-erase writing surface so it's easy to dedicate the colors to hold different forms: three P's, I/O etc. Hospital supervisors are turning to MagnaSnap patented stick-anywhere hinged-magnet sheet and note holders as a neat, fast and convenient way to post patient rounds information ... "We use MagnaSnaps to hold hourly rounding logs on bathroom doors so staff members are drawn in to the room to interact with patients," says a Nurse Manager from a Long Island hospital. "Our rounding programs improve patient and nurse satisfaction scores, patient safety, sense of security and efficiency through the reduction of call light use. I hate using tape and tacks, they are messy and pose safety issues. MagnaSnaps keep papers off the floor and posting areas neat and clean." Christian Krapf, a spokesperson for MagnaSnap adds, "Hospitals tell us MagnaSnaps give them a clear, convenient effective location in any room for posting I/O and other patient care data sheets and updates. They stick tight to any clean, dry, flat surface and come in 11 colors with a damp-erase writing surface so it's easy to dedicate the colors to hold different forms: three P's, I/O etc." MagnaSnap, a patented product from Magnatag Visible Systems keeps patient papers, charts and important hospital documents organized and conveniently located exactly where they are visible and easily seen. The two hinged magnets opposite poles snap tight together holding up to 10 paper sheets and the foam-adhesive back sticks the MagnaSnap firmly to wood, metal, glass, plaster or tile. A reusable adhesive-remover is available with them. You can order them with a printed message or logo and write on them too. For more information about Magnatag's MagnaSnap or to see the MagnaSnap video go to: http://www.magnatag.com/magnasnap .